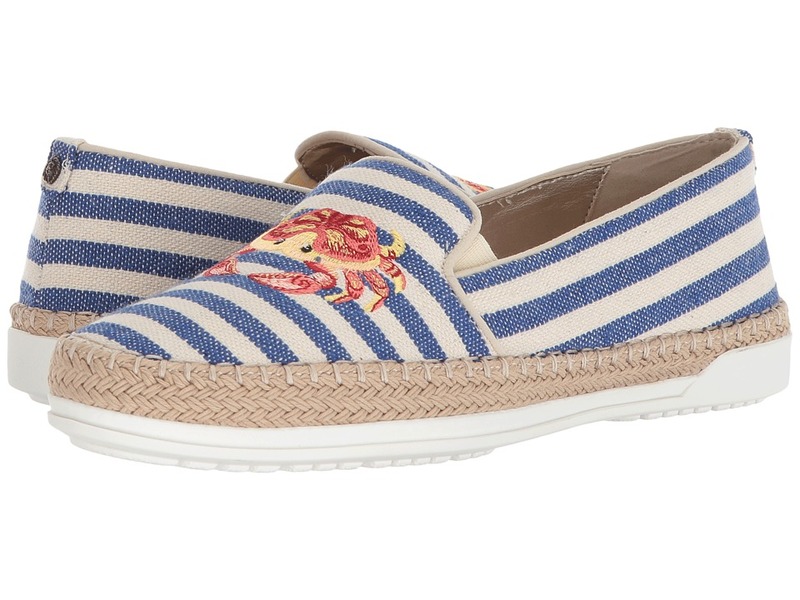 Eye-catching style combined with noteworthy comfort make for the perfect pairing in the Anne Klein Zarenna espadrille! Striped textile upper with embroidered vamp embellishment. Slip-on design with inset goring for optimal fit. Round-toe silhouette. Textile lining. Padded flex insole for the highest comfort. Woven midsole. Textured man-made outsole. Imported. Measurements: Weight: 7 oz Product measurements were taken using size 8.5, width M. Please note that measurements may vary by size. Weight of footwear is based on a single item, not a pair. 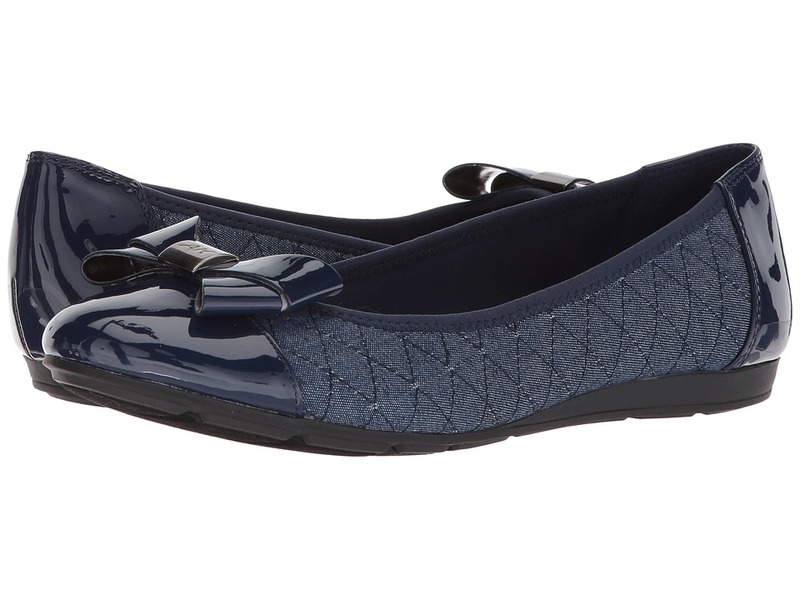 Breeze through your day with total comfort in the stylish Anne Klein Alphia flat. 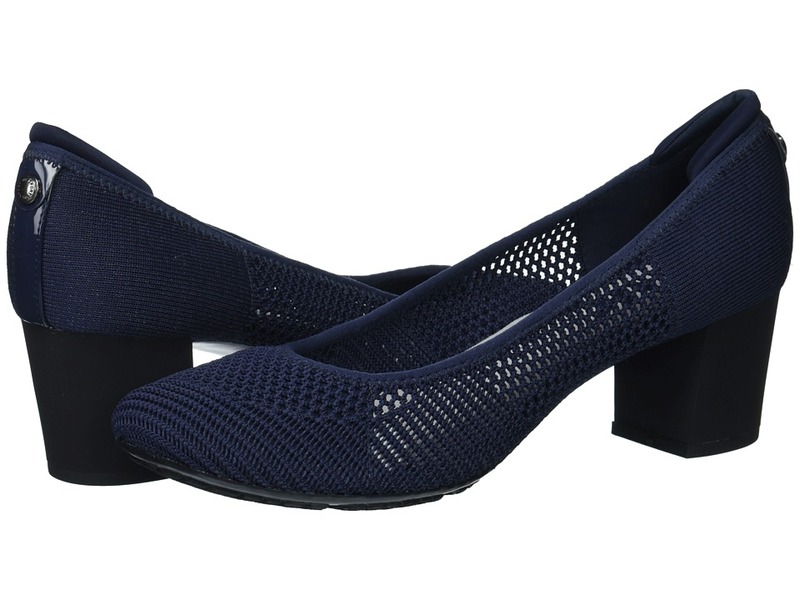 Available in a combination textile upper. Easy slip-on wear. Round, cap-toe silhouette. Decorative bow with embossed logo at vamp. Breathable textile lining and insole. Dual, lightweight foam layers provide cushioning and shock-absorption. Micro-wedge heel. Rubber sole creates a durable, stable shoe with superior traction. Imported. Measurements: Heel Height: 1 2 in Weight: 7 oz Product measurements were taken using size 9, width M. Please note that measurements may vary by size. Weight of footwear is based on a single item, not a pair. Put your contemporary look on display with the effortlessly-chic Anne Klein Cabrini wedge sandal. Elasticized textile upper. Slip-on construction. Round, open-toe silhouette. 90&amp#176 flexibility adapts seamlessly to movement. Synthetic lining. Molded footbed. Wedge heel. Rubber sole creates a durable, stable shoe with superior traction. Imported. Measurements: Heel Height: 2 1 2 in Weight: 6 oz Platform Height: 1 2 in Product measurements were taken using size 8, width M. Please note that measurements may vary by size. Weight of footwear is based on a single item, not a pair. 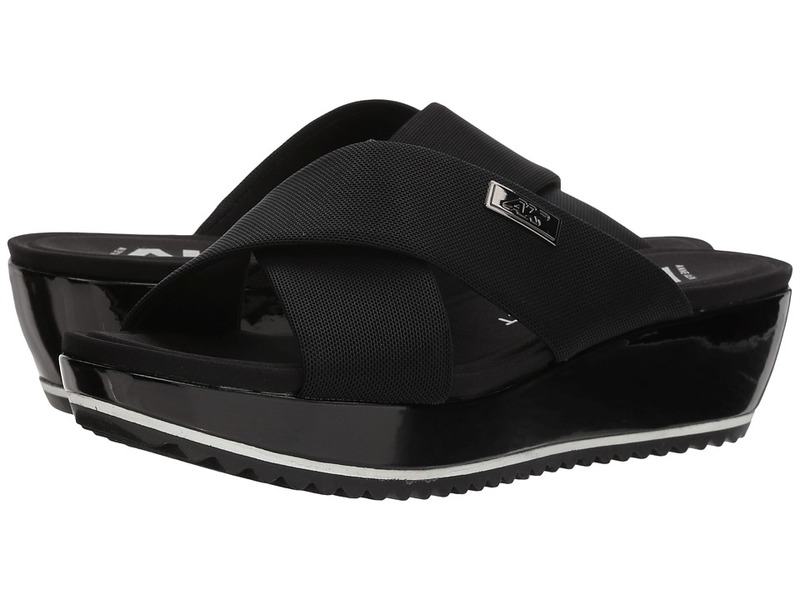 Elevate your everyday style with the modern and versatile lines of the Anne Klein Felisha slide. Woven textile upper. Slip-on construction. Open-toe silhouette. Crisscross vamp straps with polished metallic branding. Synthetic lining. Cushioned, fixed footbed. Dual, lightweight foam layers provide cushioning and shock-absorption. Wrapped platform and wedge heel. Textured rubber sport sole creates a durable, stable shoe with superior traction. Imported. Measurements: Heel Height: 2 in Weight: 9 oz Platform Height: 1 1 4 in Product measurements were taken using size 7.5, width M. Please note that measurements may vary by size. Weight of footwear is based on a single item, not a pair. Take your look from the office to happy hour with these swanky, yet chic Anne Klein Genisa heels. Textile upper with open weave. Easy slip-on wear. Round-toe silhouette. AK brand stud detailing. Textile lining and insole. Cushioned, fixed footbed. Covered block heel. Man-made outsole. Imported. Measurements: Heel Height: 2 in Weight: 9 oz Product measurements were taken using size 9.5, width M. Please note that measurements may vary by size. Weight of footwear is based on a single item, not a pair. 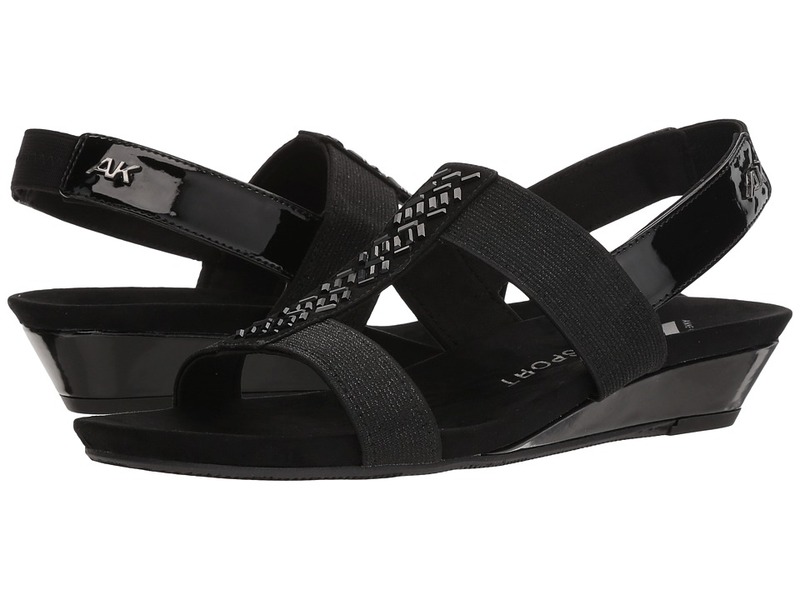 Take sporty lines to the next level in the Anne Klein Idolize slingback sandal! Combination synthetic and elasticized textile upper. Slingback ankle strap. Open-toe silhouette. Textile lining and insole. Comfort cushion AK Sport footbed. Wrapped wedge heel. Man-made outsole. Imported. Measurements: Heel Height: 1 1 2 in Weight: 5 oz Platform Height: 1 2 in Product measurements were taken using size 9, width M. Please note that measurements may vary by size. Weight of footwear is based on a single item, not a pair. A perfect match for your springtime favorites! 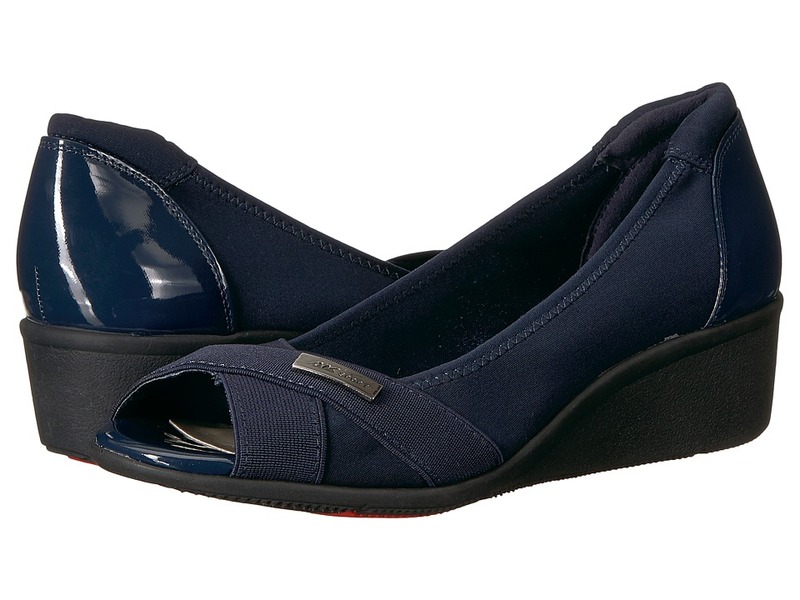 Comfort meets classic with the unmistakably versatile Anne Klein Impeccable wedge. Combination textile upper with bow embellishment. Slip-on design with thong construction. Round, open-toe silhouette. Lightly padded footbed. Man-made lining and insole. Dual, lightweight foam layers provide cushioning and shock-absorption. Molded wedge heel. Man-made AK Sport sole. Imported. Measurements: Heel Height: 1 1 2 in Weight: 5 oz Platform Height: 1 2 in Product measurements were taken using size 7.5, width M. Please note that measurements may vary by size. Weight of footwear is based on a single item, not a pair. Take professional comfort to the next level! Sporty chic is in and the Anne Klein Jetta wedge is a sure hit! Combination textile and synthetic upper. Easy slip-on construction. Round, open-toe silhouette. Man-made lining. Dual, lightweight foam layers provide cushioning and shock-absorption. Molded wedge heel. Rubber sole creates a durable, stable shoe with superior traction. Imported. Measurements: Heel Height: 1 1 2 in Weight: 7 oz Product measurements were taken using size 9.5, width M. Please note that measurements may vary by size. Weight of footwear is based on a single item, not a pair. 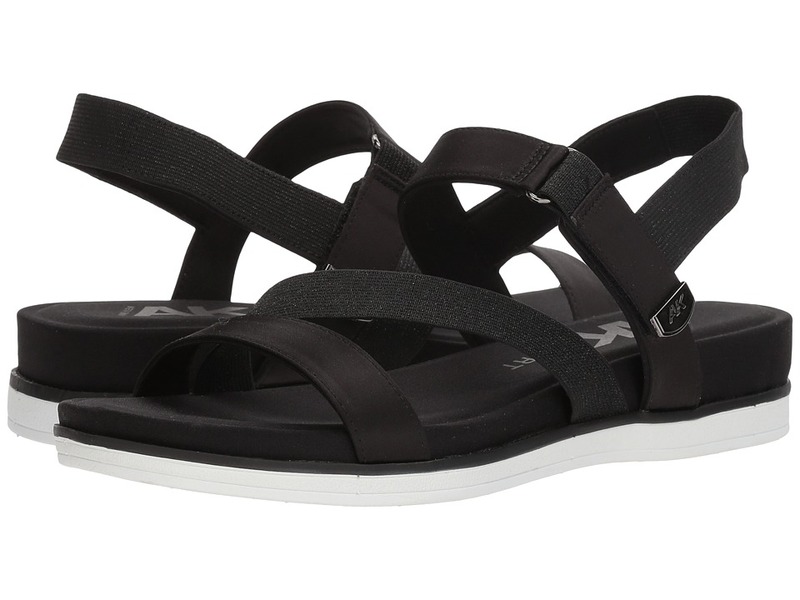 Take sporty lines to the next level in the Anne Klein Nolita sandal! Comes in a variety of upper materials. 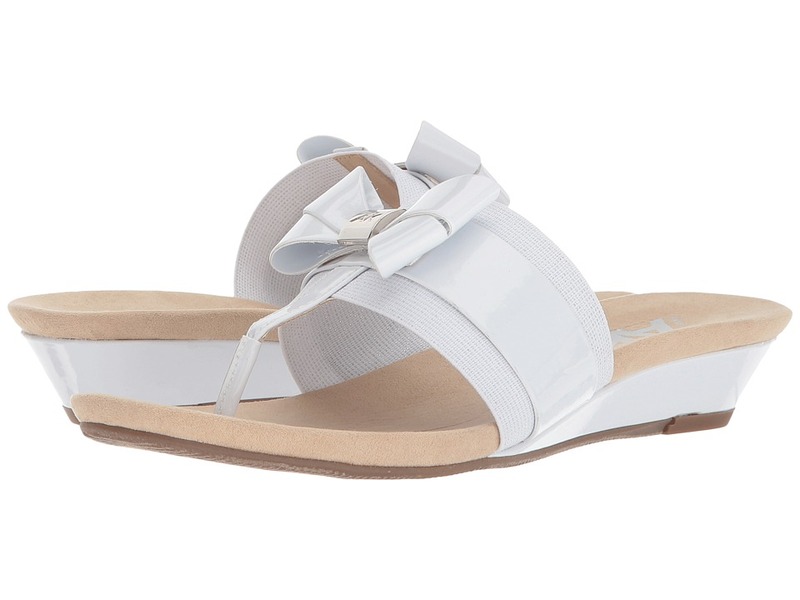 Slingback ankle strap with hook-and-loop closure. Open, round-toe silhouette. Textile lining and insole. Comfort cushion AK Sport footbed. Man-made outsole. Imported. Measurements: Heel Height: 1 1 4 in Weight: 6 oz Platform Height: 3 4 in Product measurements were taken using size 9, width M. Please note that measurements may vary by size. Weight of footwear is based on a single item, not a pair. 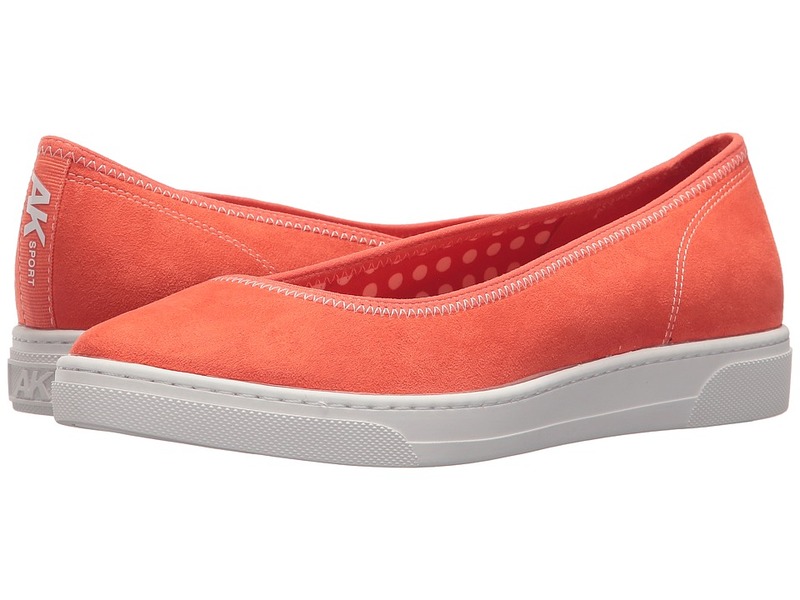 Your daily errand running just got a fashion-forward boost with the fresh and sporty Anne Klein Overthetop slip-on. Available in a variety of textile uppers. Slip-on construction. Almond-toe silhouette. Man-made lining and insole. Lightly-padded footbed. Dual, lightweight foam layers provide cushioning and shock-absorption. 90&amp#176 flexibility adapts seamlessly to movement. Rubber sole creates a durable, stable shoe with superior traction. Imported. Measurements: Weight: 8 oz Product measurements were taken using size 7.5, width M. Please note that measurements may vary by size. Weight of footwear is based on a single item, not a pair. A sleek simple style boasts a high level of sophistication in the Anne Klein Paprika wedge sandal. Combination textile upper. 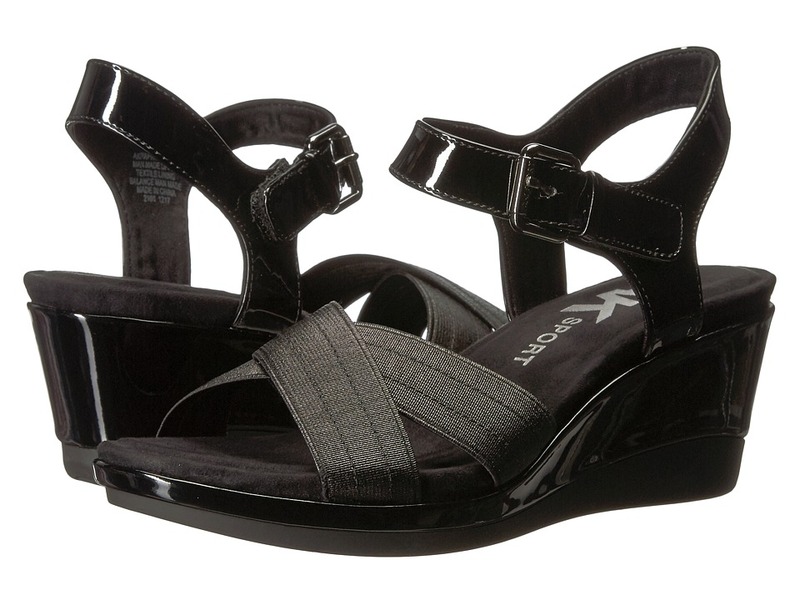 Ankle strap with hook-and-loop closure and buckle detail. Round, open-toe silhouette. Crisscross vamp strap with tonal stitching. Textile lining and insole. Dual, lightweight foam layers provide cushioning and shock-absorption. Wrapped wedge heel. Rubber sole creates a durable, stable shoe with superior traction. Imported. Measurements: Heel Height: 2 1 2 in Weight: 9 oz Platform Height: 1 in Product measurements were taken using size 8, width M. Please note that measurements may vary by size. Weight of footwear is based on a single item, not a pair. 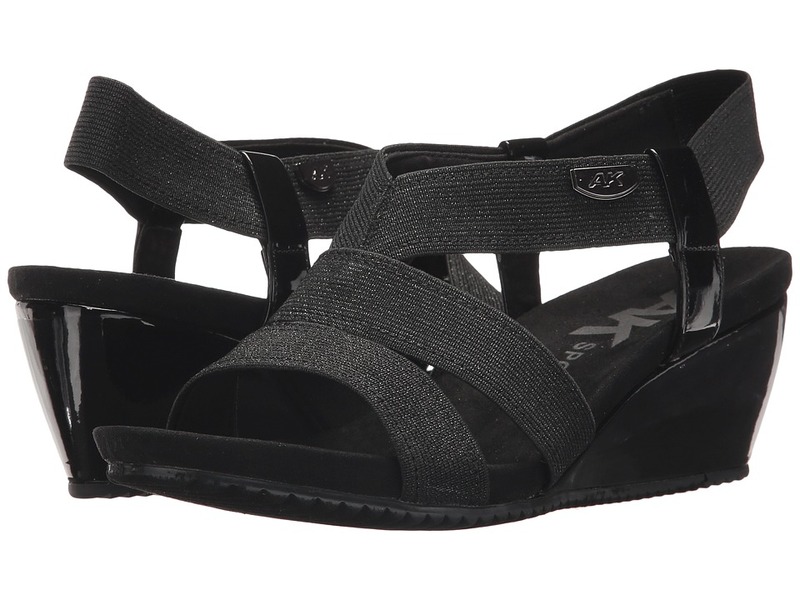 Take sporty lines to the next level in the Anne Klein Peppina slingback sandal! Combination synthetic and elasticized textile upper. Slingback ankle strap. Open, round-toe silhouette. Textile lining and insole. Comfort cushion AK Sport footbed. Wrapped wedge heel. Man-made outsole. Imported. Measurements: Heel Height: 2 3 4 in Weight: 9 oz Platform Height: 1 in Product measurements were taken using size 8.5, width M. Please note that measurements may vary by size. Weight of footwear is based on a single item, not a pair. A perfect match for your springtime favorites! Cute meets classic with the polished and pretty Anne Klein Qtee sandal. Man-made upper with a colorful bead or rhinestone embellishment depending on colorway. Slip-on design. Round, open-toe silhouette. Lightly padded footbed. Man-made lining and insole. 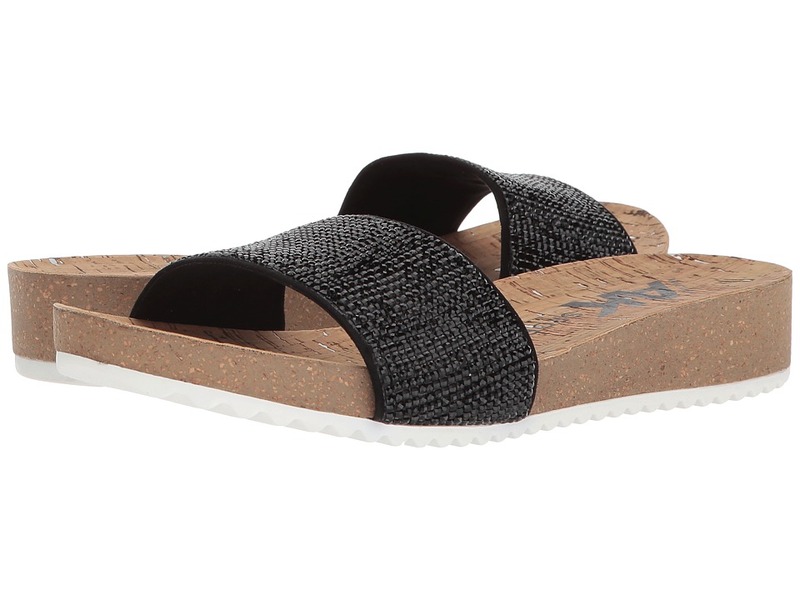 Molded, cork footbed. Man-made AK Sport outsole. Imported. Measurements: Heel Height: 1 1 4 in Weight: 7 oz Platform Height: 3 4 in Product measurements were taken using size 9, width M. Please note that measurements may vary by size. Weight of footwear is based on a single item, not a pair. Display a powerfully dramatic silhouette against the oceanic background wearing the Heidi Klein Cannes Ruched Bandeau Control One-Piece. Sweetheart neckline. Removable halter strap. Ruched twist design at front to accentuate the body. Side boning, built-in soft cups, and underwire for added support and comfort. Full rear coverage. 72 percent polyamide, 28 percent elastane. Hand wash cold, line dry in shade. Imported. This item may ship with an attached security tag. Merchandise returned without the original security tag attached or a damaged tag may not qualify for a refund. Measurements: One Piece Length: 22 in Product measurements were taken using size SM. Please note that measurements may vary by size. If you~re not fully satisfied with your purchase, you are welcome to return any unworn and unwashed items with tags intact and original packaging included. Feel like a movie star on the beach wearing the Heidi Klein Cannes Double String Bottom. Low rise. Fully elastic waist and legs for a close fit. Ruched center back provide close fit. Elastic rouleaux side straps. Moderate rear coverage. 72 percent polyamide, 28 percent elastane. Hand wash cold, line dry in shade. Imported. This item may ship with an attached security tag. Merchandise returned without the original security tag attached or a damaged tag may not qualify for a refund. Measurements: Waist Measurement: 24 in Front Rise: 7 in Back Rise: 8 in Leg Opening: 8 1 2 in Product measurements were taken using size MD. Please note that measurements may vary by size. If you~re not fully satisfied with your purchase, you are welcome to return any unworn and unwashed items with tags intact and original packaging included. Finally take that cruise to exotic places with the Heidi Klein Cannes Push-Up Top. Push-up style bikini top. Adjustable slender shoulder straps. Back tie closure for adjustable wear. Underwire shelf bra with soft cups to add comfort and support. 72 percent polyamide, 28 percent elastane. Hand wash cold, hang dry. Imported. This item may ship with an attached security tag. Merchandise returned without the original security tag attached or a damaged tag may not qualify for a refund. Measurements: Length: 21 in Product measurements were taken using size SM. Please note that measurements may vary by size. If you~re not fully satisfied with your purchase, you are welcome to return any unworn and unwashed items with tags intact and original packaging included. Escape to a far-off exotic location wearing the Heidi Klein Cannes Double String Top. Classic triangle bikini top. Double string halter neck tie and lower back tie with decorative, gold-tone hardware adjuster for desired look. Fully lined cups. 72 percent polyamide, 28 percent elastane. Hand wash cold, line dry in shade. Imported. This item may ship with an attached security tag. Merchandise returned without the original security tag attached or a damaged tag may not qualify for a refund. Measurements: Length: 37 in Product measurements were taken using size SM. Please note that measurements may vary by size. If you~re not fully satisfied with your purchase, you are welcome to return any unworn and unwashed items with tags intact and original packaging included. Channel some vintage vibes in the Calvin Klein Long Sleeve with Tie Cuff and Piping Detail Sheath Dress CD8C14LN. Sheath silhouette. Solid colorway on a stretch-poly fabrication. V-neckline. Three-quarter sleeves with tie cuffs. Concealed zipper closure at back. Lined. Straight hemline. 94 percent polyester, 6 percent spandex Lining: 100 percent polyester. Dry clean only. Imported. Measurements: Length: 36 1 2 in Product measurements were taken using size 2. Please note that measurements may vary by size.